Play-offs, home draws, European qualifying and local bragging rights are at stake on the last day of the Pro14's regular season. Glasgow's win over Leinster was a "big moment" in their season, according to head coach Dave Rennie. Why don't Saracens and Glasgow get along? Read more on Why don't Saracens and Glasgow get along? Stuart Hogg will move from Glasgow Warriors to Exeter Chiefs next year. Watch the Scotland full-back's 11 Six Nations tries. Edinburgh and Glasgow seek to take the next step in the Champions Cup against two of the competition's big hitters. Glasgow co-captain Ryan Wilson opens up on family, why there's 'no panic' at Warriors and his 'disgust' at John Barclay's TV career. Ben Atiga, the All Black who quit rugby at the top of his game, is using his time in a "dark place" to help Scotland's players with their mental health. The Scottish Rugby Union must "show aspiration" in how it replaces Glasgow's Scotland full-back Stuart Hogg, believes Tom English. 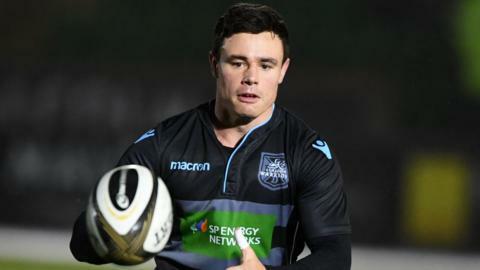 Scotland wing Sean Maitland looks forward to a Scotstoun return and says his Saracens team-mates know they are in for a real test against Glasgow. Vern Cotter was given a hero's exit from Scotland - now the former coach returns with Montpellier to face Edinburgh. Stuart Hogg tells Tom English he used to be the "class clown" but is taking a different approach now as he prepares to lead Scotland against USA. Glasgow head coach Dave Rennie has big issues to tackle after his side's Pro14 semi-final exit, says BBC Scotland's Tom English.